SAN JOSE, Calif., Feb. 7, 2013 — Shopilly, Inc., an innovative visual shopping platform, announced today the release of its first list of Power Retailers and Brands. The ranking is based on the number of followers each brand has accumulated on Shopilly.com. 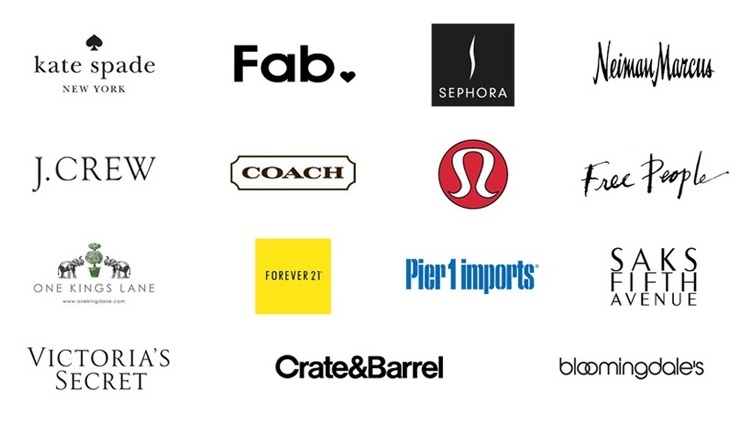 Thousands of style-savvy consumers have elected to receive marketing messages, deals, sales, offers and discounts from these retailers and brands. Selected from a list of hundreds of online and multi-channel options, the popularity rankings provide a material indicator of reach, influence and trendiness. The only two exclusively online brands to crack the top 15 are Fab.com at No. 3 and One Kings Lane at No. 11. Their popularity can be attributed to excellent marketing campaigns and valuable and unique email content. The mix of apparel, accessories, beauty and home brands on the list indicates that the brands themselves generate consumer interest, making product category a virtual non-factor. Notable absences from the list include Amazon, the Gap brands, Nordstrom and the Williams-Sonoma brands. Built on an intuitive and elegant user experience, Shopilly, Inc. streamlines and organizes multi-channel retailer communications across hundreds of brands and thousands of daily messages. Cutting through the clutter, Shopilly’s visual platform presents shoppers with a useful, easy and fun way to stay informed about brands, stores, offers and purchases. Shopilly was founded in 2012 and is based in San Jose, California. This entry was posted in Shopilly Buzz by jeffhsnow. Bookmark the permalink.